IJoy RDTA Box Review - Daily Vaping Deals & The Best Vape Product Reviews at Vaping Cheap! IJoy has been releasing tons of impressive products this year, and they’re continuing to do so. When they released their IJoy Limitless RDTA and IJoy Combo RDTA, it quickly became a favorite for many vapers. 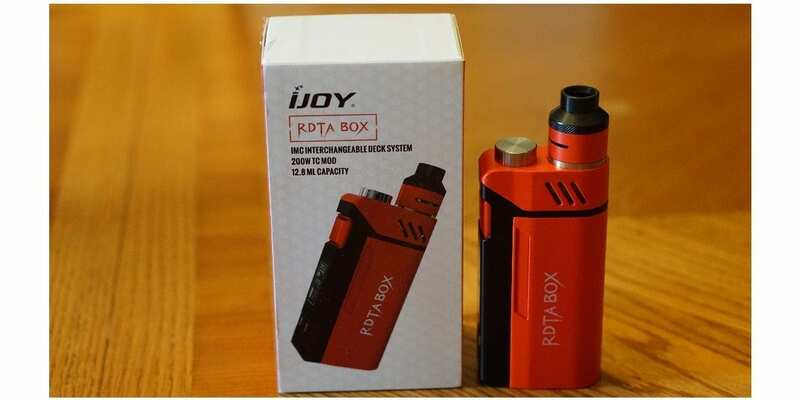 Now, IJoy has released their brand new IJoy RDTA Box. This is an all in one device, bringing you all of the great things about the IJoy Combo RDTA and building it into a box mod. Firstly, I would like to thank Heaven Gifts for sending me this product for the purposes of this review. I will go over my first impressions out of the box, building and wicking, its overall performance, pros and cons and conclude with telling you whether or not I recommend this device! 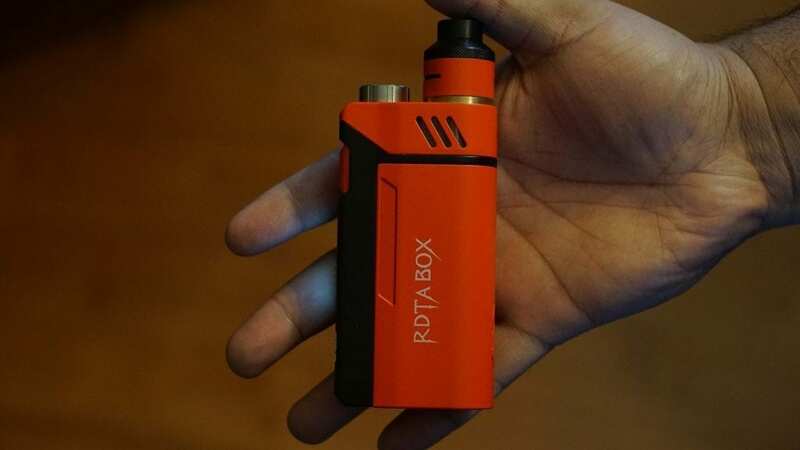 Check Out the IJoy RDTA Box Here! Click Here to Check Out the IJoy RDTA Box! When I first received the IJoy RDTA Box, the first thing I noticed was the great packaging. All of IJoy’s products are all packaged really well, and provide you with tons of information about what’s inside. This is a huge pro to me, as a good first impression goes a long way. I also noticed how large the packaging was, so I immediately expected this device to be quite large. Upon sliding the package open, it reveals the IJoy RDTA Box. My first impression of the device itself is that, it is quite large indeed. Even though this is a larger device, it did not mean it was uncomfortable to hold. It felt comfortable right away to hold, and I typically use smaller box mods as my daily device. Right at the top of the device is where your fill port is located, and it’s huge. You can literally pour e-liquid into the fill port with no issues, that’s how large the fill port is. So ease of filling is definitely a pro right away. I’m glad the fill method is like this, because the IJoy RDTA Box holds a whopping 12.8ml of e-liquid! Also, this device has a rather large fire button. It probably has the largest fire button out of all the devices I currently own. With this large of a fire button, there’s no way you would have an issue locating the fire button when using this device. Inside of the packaging, you do receive the device itself, a pre-made coil head, 1 screwdriver, a manual, 1 tool pack and a micro USB cable. It is worth noting that this device does not support USB charging, and the USB port is used for updates only. Some may find this as a con, but we recommend to always charge your batteries externally as this is the safest way. It also comes with a top cap, which is meant to seal the RDTA itself while traveling. Honestly, I wasn’t too sure if this would prevent the device from leaking if it were on its side. It is a nice inclusion though. In addition, something else worth noting is that the IJoy RDTA Box is compatible with the same build decks the IJoy Combo RDTA utilizes. 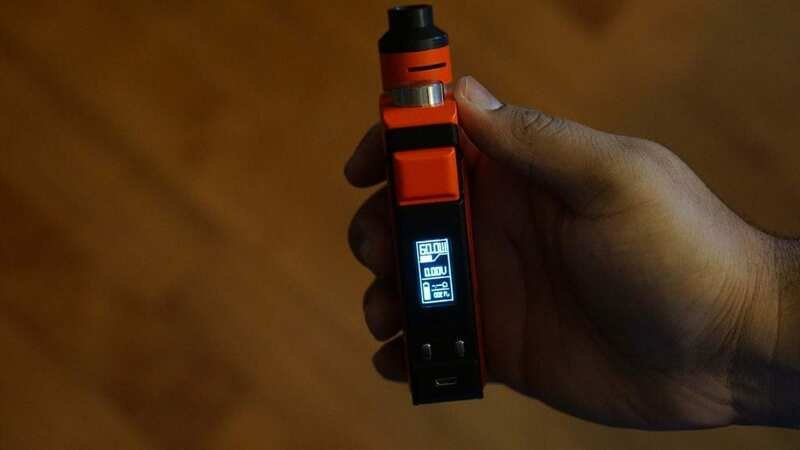 So, if you have other build decks for that atomizer, you can use them with this all in one device, which is a huge pro! The included build deck is the velocity styled build deck, which was another pro for sure. The IJoy RDTA Box has a sliding door to access your battery tray, which makes accessing your batteries quick and easy. It does feel solid, and stays in place firmly, which is definitely a good thing. In addition, inserting your batteries into the tray and taking them out is effortless. This device does require 2 high drain 18650 batteries, which are not included. I do want to mention that the overall design of the IJoy RDTA Box may not be for everyone, as it is quite large. However, I personally liked the overall design, and was happy to see something different in the market. The IJoy RDTA Box came clean with no machine oil, so one rinse with water and this device was good to go! I do not recommend having water touch anywhere, but the inside of the tank section. It isn’t difficult to clean since the fill port is large, and the deck section can be taken out. All in all, my first impressions of the IJoy RDTA Box was all positive! This device is unique, and brings something to the market that hasn’t really been done before. Like stated previously, the IJoy RDTA Box does include both a velocity styled build deck and a pre-made coil. The pre-made coil features a triple coil design, and is simple to install. The included velocity styled build deck is quite large, and can certainly fit a decent sized build with no issues. If you’ve read any of our previous RBA reviews, you know we love velocity styled build decks, because of how easy they are to build on, and it’s great for beginners. With that being said, building on the IJoy RDTA Box is incredibly easy, and you can easily fit fused Clapton or Alien coils with little to no issues. This is a huge pro for this device. 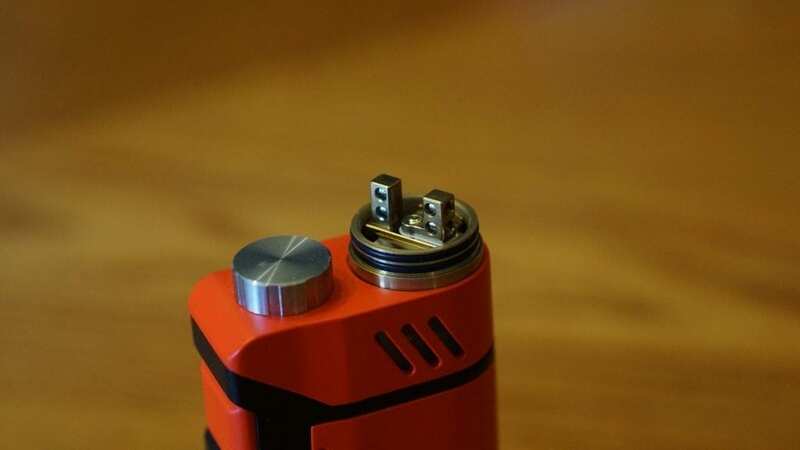 Wicking the IJoy RDTA Box is also very easy, especially if you’re already familiar with wicking previous IJoy RDTAs. I literally wick this exactly the same as I did with the IJoy Combo RDTA. The best way I found for wicking this device is cutting the cotton so it can easily lay into the channels, and hang towards the top of the tank section. With this wicking method, I experienced nothing, but a flavorful and saturated vape every single time. All in all, building and wicking the IJoy RDTA Box is easy. With the included velocity styled build deck, and wicking channels, it just makes the entire process effortless, which is a huge pro to this device. The performance of the IJoy RDTA Box is incredible to say the least! My preferred build for this device was a dual fused Clapton, which had a resistance of 0.18 ohm. I would normally vape this build around 75w to 115w. With this build, I got a ton of flavor and excellent vapor production. I did try other builds such as normal 24ga and 22ga Kanthal, and the performance was excellent as well. The included pre-made coil head vaped just fine as well, but I just prefer to build my own coils. I do think it’s a huge pro for them including it, as some people like the convenience of installing pre-made coil heads. However, I do think this device really shines when you install your own coils. The IJoy RDTA Box also has tons of available airflow, and it is slightly different than the IJoy Combo or the IJoy Limitless Plus RDTA. The cap itself seems to be just slightly shorter, and the airflow just seems to be different. Not incredibly noticeable, but still worth mentioning. It vapes relatively the same as the previous IJoy RDTAs, which is definitely a good thing. Speaking about airflow, I preferred to close it about half way. With the airflow like this, you get a nice restriction, and it increases the flavor as well. With the airflow wide open you do lose a bit of flavor, but it is to be expected. Also, this device does feature a wide bore drip tip. However, a con to the IJoy RDTA Box is that it does not come with a 510 drip tip adapter, so you cannot use your own preferred 510 drip tips. I do want to mention that the IJoy RDTA Box can seriously guzzle e-liquid, especially with a Clapton build. I could easily go all day without needing to refill, but if I were chain vaping, then I’d have to fill it in about 4 or 5 hours maximum. Like said previously, I’m glad this device holds 12.8ml of e-liquid. Also, with the wicking method I mentioned previously, I experienced no dry hits, and it wicked perfectly. In addition, I experienced little to no spitback while vaping. The performance of the box mod itself was also very good. The display looks similar to the IJoy Maxo, but not exactly the same. However, the basic functions and going through the menu is basically the same, which means navigating through it is simple and quick. Also, the screen is nice and bright, which makes it very easy to see. I did test this device in Stainless Steel Temperature Control Mode and it worked just fine. It does also feature temperature control for Ni200 and Ti. This device is rated up to 200w, but I’m not sure if it exactly delivers this much wattage with only two 18650 batteries. However, when vaping at 75w to 120w, it definitely feels like it’s giving me the power. I do like the user mode, where you can basically set it up to have a preheat function. You can set it to vape at 120w for a second, and drop down to 75w afterwards. This is definitely a nice addition to this device, and I found myself using it quite often with Clapton builds which require a ramp up time. This device does also feature hard, normal and soft modes. Also, using this device is quite comfortable. I do feel that people with smaller hands may not like how large the device is, but for me, it was very comfortable. At first, I thought it would take some time to get used to, but I found it comfortable right away. When you are vaping, the tank itself has a light inside, so you can easily see through the glass window how much e-liquid you have left. I found this to be quite useful, as without that light it’s much more difficult to see inside. The battery life is what you would normally get with any dual 18650 box mod. I can get about half a day or three quarters of a day of battery life depending on how much I vaped, and what wattage I was vaping at. I do want to mention that you cannot use any other atomizer with this device. This is to be expected due to its design, but still has to be mentioned. All in all, the performance of the IJoy RDTA Box was excellent! The flavor and vapor production off of this device was simply incredible! In the next section, I will summarize the pros and cons to this device. 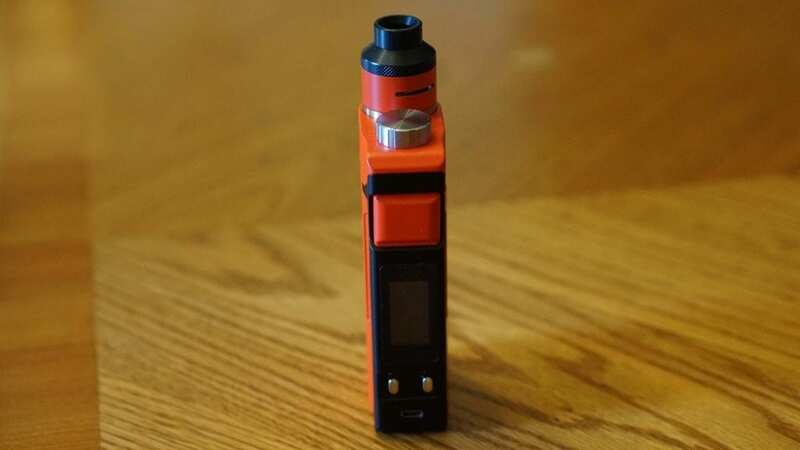 In conclusion, the IJoy RDTA Box is an excellent device, and fans of the IJoy Limitless Plus RDTA and IJoy Combo RDTA will absolutely love this device. It does have some minor cons to it, but none of them are deal breakers in my opinion. The overall performance is outstanding, and the ease of building and wicking just makes this device that much better. Not to mention, the IJoy RDTA Box is a unique device and certainly much different than any other device on the market today. All in all, the IJoy RDTA Box is a winner in my book. If offers the excellent performance of an RDTA and packs it into one device. With a 12.8ml e-liquid capacity, you can certainly get through the entire day without needing to refill. If you’re a fan of IJoy RDTAs and it’s the atomizer you primarily vape, then I can easily recommend the IJoy RDTA Box. In addition, if you’re just looking for something unique and affordable, then the IJoy RDTA Box is surely a solid option! Thanks for reading! Hopefully this review has helped you with finding the right device that fits your vaping needs! Feel free to leave any questions or comments below!